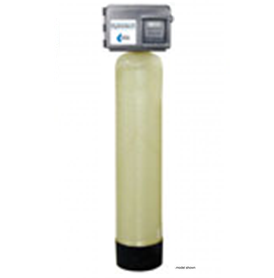 The 2510AIO Chemical Free Iron filter is intended to be an effective and economical way to remove iron from water without the use of messy and dangerous chemicals or expensive pumps or an external venturi. The 2510AIO valve uses a patented construction to create an air bubble at the upper portion of the tank to oxidize any ferrous iron prior to being filtered by the media. It can also used to remove low concentrations of dissolved hydrogen sulfide and manganese from water. 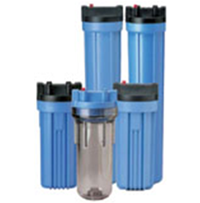 Standard filter housings are manufactured of a durable polypropylene or clear Styrene-Acrylonitrile (SAN). All are equipped with 3/4″ FPT inlet and outlet ports. Reinforced polypropylene housings have excellent chemical resistance and are ideal for many residential, commercial and industrial applications. 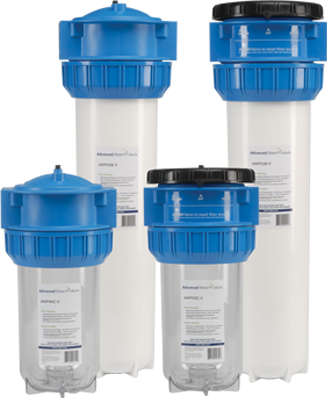 Clear sumps are manufactured from a clear, FDA-approved Styrene-Acrylonitrile (SAN) and offer on-site examination of the cartridge. Standard filter housings are available in both 10″ and 20″ lengths and will accommodate a wide range of 2-1/2″ and 2-7/8″ diameter cartridges. The AWP line offers High Flow 3 Piece Plastic Housings. These housings are manufactured from food grade materials. All can be used for point-of-entry (POE) applications as they can handle flow rates starting at 16 USGPM, depending on the cartridge being used. The housing come equipped with a pressure release button on both the non-valved and valve-in-head systems. They have a maximum operating temperature of 38°C (100°F) and can handle pressures up to 100 psi (6.9 bar). The white opaque design has a convenient drain plug, while the transparent sumps do not.